Happy new year once again. 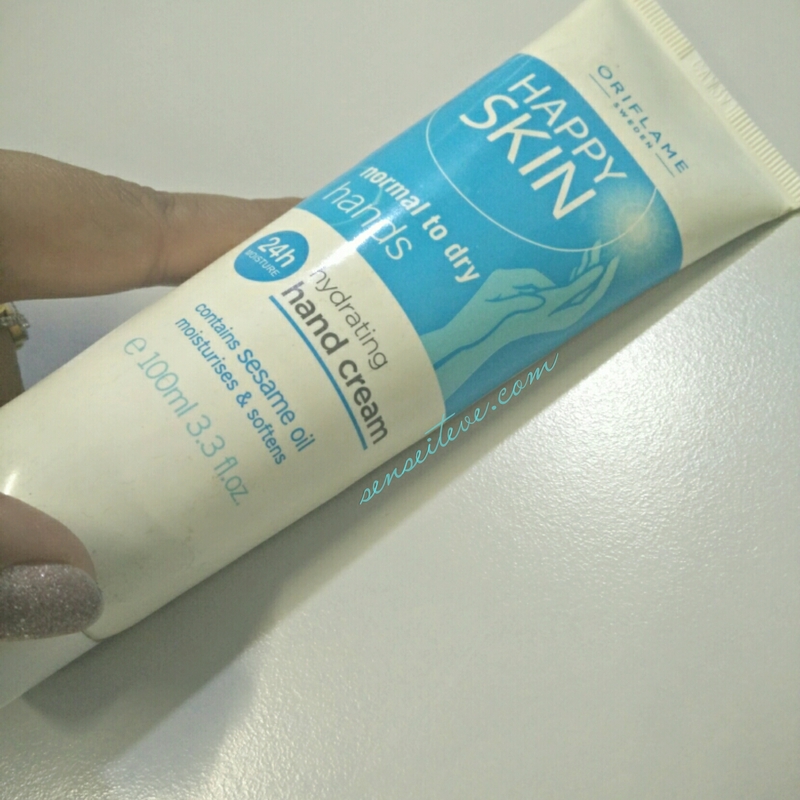 Today I am here with review of Oriflame Happy Skin Hydrating Hand Cream for Normal to Dry Hands. Few years back I used to think that hands creams are waste of money and body lotions can take care of hands good time, that was when I have not used a single hand cream. And when I first used a hand cream, I realized how wrong I was and since then I am hooked to hand creams and they are staple in my handbag. 199/- INR for 100ml. (Comes on discount time to time). AQUA, GLYCERIN, COCOS NUCIFERA (COCONUT) OIL, ALCOHOL DENAT., CETYL ALCOHOL, STEARYL ALCOHOL, DIMETHICONE, GLYCERYL STEARATE SE, PARFUM, IMIDAZOLIDINYL UREA, METHYLPARABEN, CETEARETH-20, CARBOMER, STEARIC ACID, PROPYLPARABEN, SODIUM HYDROXIDE, BUTYLPHENYL METHYLPROPIONAL, LINALOOL, SESAMUM INDICUM (SESAME) SEED OIL, LIMONENE, CITRONELLOL, ALPHA-ISOMETHYL IONONE. Watery cream texture and light consistency. Fragrance: Light floral. Oriflame happy skin hydrating hand cream for normal to dry skin gets absorbed quickly into skin and doesn’t leave residue or feel sticky. I have normal skin and it serves perfect purpose of hydrating my hands though i feel it might not be suitable for extremely dry skin. It keeps my hands hydrated for 2 hours max and sometime when the weather is colder then i need to reapply it very often. Perfect for normal and oily skin. Reasonably priced for the quantity. Not for extremely dry skin. May not provide sufficient hydration in extreme winters. I love this hand cream despite the cons. And I have repurchased it already. 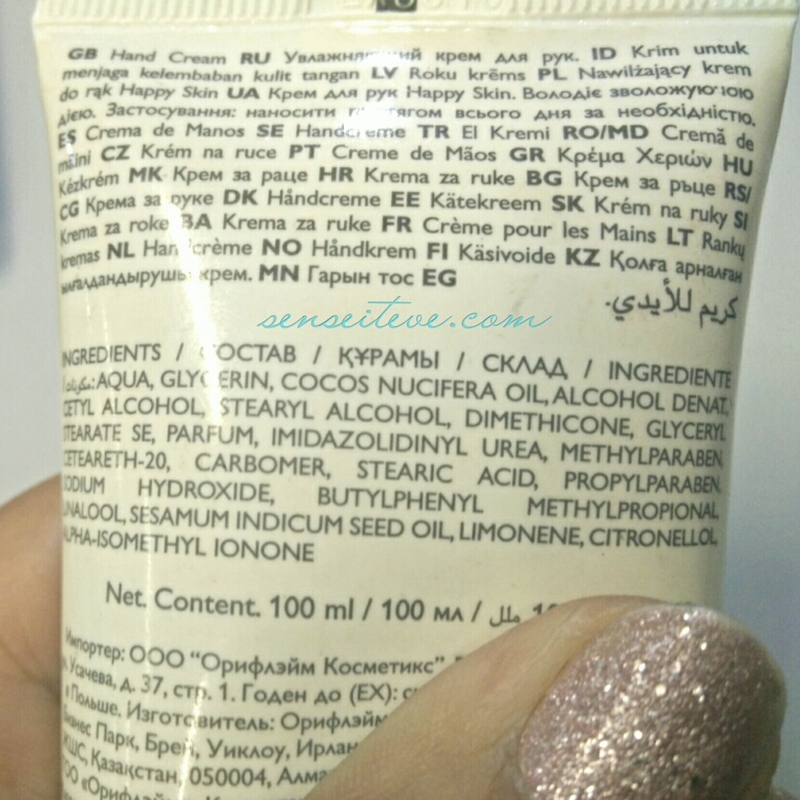 It is great hand cream for normal to oily skin people all year around except for extremely chilly days. Recommended: Yes to normal, oily and little dry skin. Not for extremely dry skin. 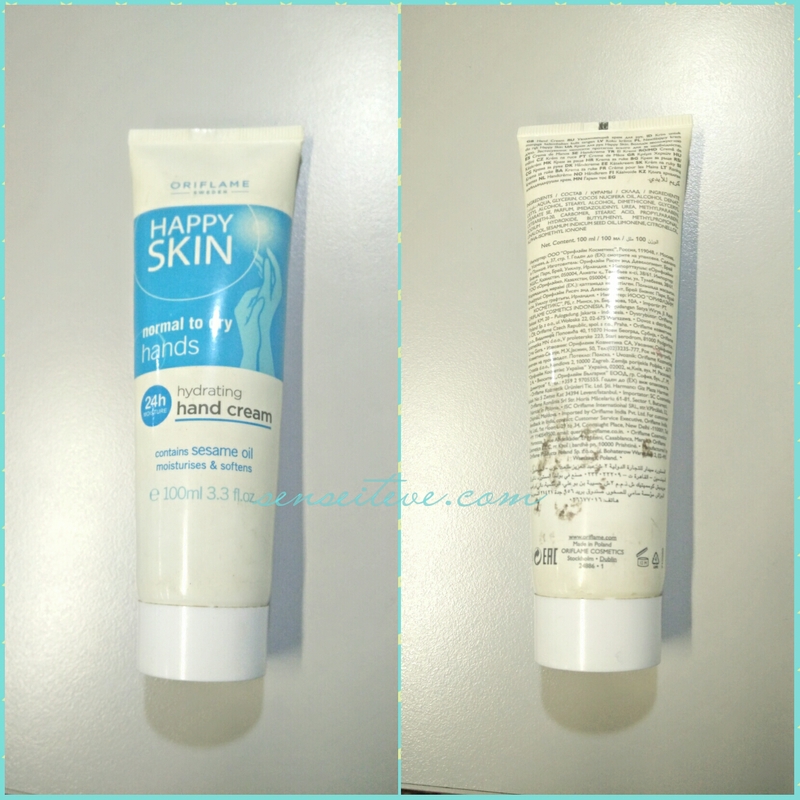 Have you tried Oriflame Happy Skin Hydrating Hand Cream? Share your thoughts about it in comment section below. Great product which has a decent price and performs well for normal skin. Yes you are right dear…do givenit a try. I guess I need more hydrating hand cream for winters. This looks like a decent buy for the summer time! thanks I usually end up buying the ones that get too greasy so this would be perfect! Yep this is non greasy and sinks into skin.. Sounds like a nice hand cream! Thanks for sharing! Great post! I find I depend on these too, especially in the winter. I wash my hands alot. I like that size of this, but do not like that it has alcohol, but maybe that is good for sanitary reason.s. Still I would use it to put in my bag, as you do. Great post! Yeah it is great companion in your handbag…even i thought so that alcohol might be for sanitizing purpose.. Such a spot on review! You can try TBS Shea butter hand cream… you might like it..
At first even I neglected hand creams but now it’s a must for me. Good review! doesn’t sound suitable for my skin. thanks for the review! I wonder why only a woman’s hand gets dried. My husband works the same amount under water as me then why he does not need to use hand cream? I am always irritated due to my dry hands. Ankita recently posted…What are the benefits of intermittent fasting? This sounds good enough for use in summers. For normal skin this seems to be a good product, but not for dry!! I am skipping it.